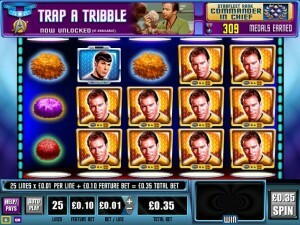 In the third episode of Star Trek, the WMS slot machine series, you get a game called The Trouble With Tribbles. It is inspired by the tribble creatures, which were part of one of the most memorable episodes from the original Star Trek. The idea behind that episode was that these cute little creatures would multiply like crazy when water got on them, and the entire ship was invaded by them. Like the other Star Trek slots, it’s inspired by the 70s version of Star Trek. 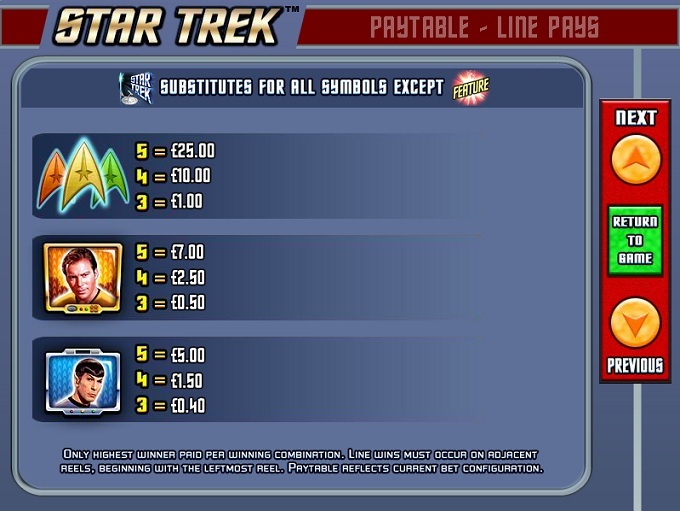 All WMS Star Trek slots come with 25 paylines, and this one is no exception. 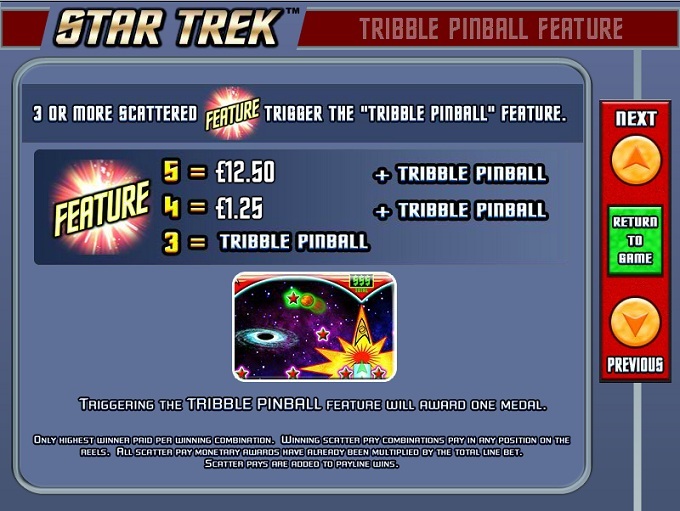 The features consist of scatters, wilds, the Win Warp and the bonus game called Tribble Pinball. You can win a prize of $5,000 with a bit of luck. 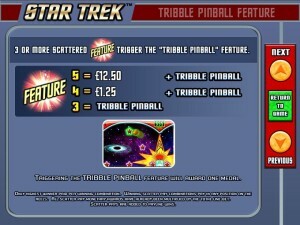 Among the features you can expect to find inside there is the Win Warp bonus, the wild symbol, scatters and the Tribble Pinball bonus game. First of all, let’s take a look at the wild symbol, which is the least interesting part of the feature list, at least in this game. It’s a simple wild, which will take other roles and bring you more wins, but it will not apply multipliers, will not offer its own prizes and will not replace scatters. You will recognize the scatter symbol by the red explosion taking place on it and by the fact that it has the word Feature written in the front of it. 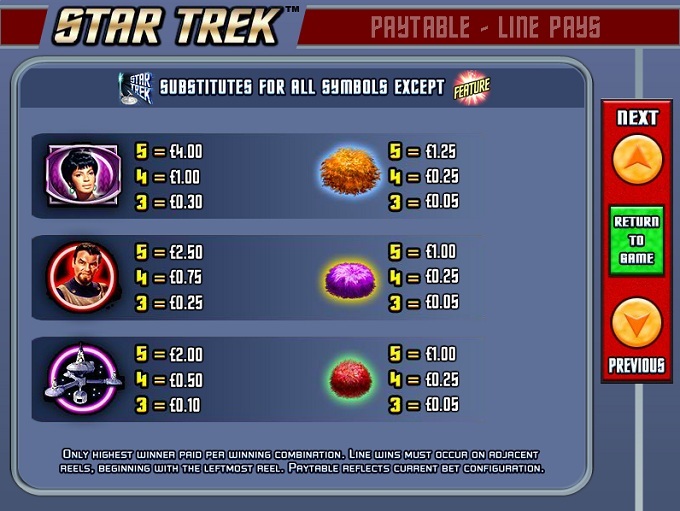 Have enough of these scatters present, no matter what their position is, and you can expect a payout of 5x to 50x the wager (four or five symbols), or the Tribble Pinball feature (3 to 5 scatters). Once you trigger the bonus game, you are given a medal which you can use to advance your rank, and then you play a feature where you have a pinball game of sorts. The tribbles come into the machine, bounce from one object to another, and eventually go into a tube. The tubes in which they go will award prizes to you, of different values. With the extra bet, which is a must in this game, you will get the Win Warp feature from time to time. The bonus game will give you one of four types of randomly chosen features. It can be a round with up to two wild reels, it could be a multiplier for the wins of the round, a multiplier of up to 10x for the wins of the wilds, or a fly-by from Enterprise where you get a lot of high paying symbols of the same type. With a maximum bet of $70, it could be a good option for those with larger budgets, but it goes to as little as $0.35 as well, depending on the coin’s denomination ($0.01 to $2). You use 10 coins for the feature bet and another 25 for the paylines. 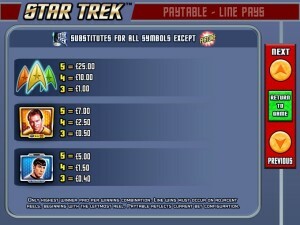 The same symbol as in the other Star Trek slots is responsible for the 2,500 coins of the jackpot, with a value of up to $5,000. The design is clean and inspired by the look of the old Star Trek series. It has the old phaser weapons, tricorders and communication devices among its symbols, along with the pictures of the actors and other related images. It’s not an overly complicated design, but that works very well with the 70s era series around which it was themed. 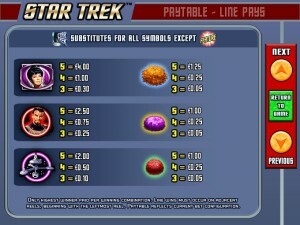 Symbols: Star Trek Logo (wild), Feature Logo (scatter, 50x total bet), Colored Badges (2,500 coins), Captain Kirk (700 coins), Spock (500 coins), Uhura (400 coins), Officer (250 coins), Starbase (200 coins), Orange Tribble (125 coins), Pink Tribble (100 coins) and Red Tribble (100 coins). It’s a different Star Trek game, a different story and a new bonus feature to explore. Give it a chance if you tried the other ones as well. Star Trek Episode 3 – The Trouble With Tribbles can be found at any WMS casino, where you get a chance to play it for real money or in free mode.